Visit The Fur Cultural Revival website for more information. The Fur, also named the Fora, Fordunga, Furawi, Konjara, or Kungara, migrated as refugees to the United States from western Sudan, principally from the Darfur region. 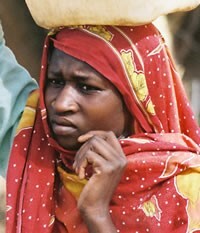 Sometimes people confuse their people group name with the region, Darfur, they are from in Sudan. They speak Fur, which has no written or symbolic script and makes their language very much an orally transmitted language. Many also speak Arabic. Dance is very much a part of their culture. Special occasions such as weddings, births of a child, or other special events are celebrated with their own specific dance style. They are well known for their devotion to Islam. However, their Islam is mixed with their indigenous traditions and customs. In fact, their identity is often tied to their traditional beliefs more than their professed public religion of Islam. Fur who are well educated are often more secular than Muslim. Pray that God will use dreams to reveal the truth and hope found in God becoming an intimate as revealed through Jesus Christ. Pray that evangelicals will intentionally live among, learn their language, and share a contextualized form of the Gospel.